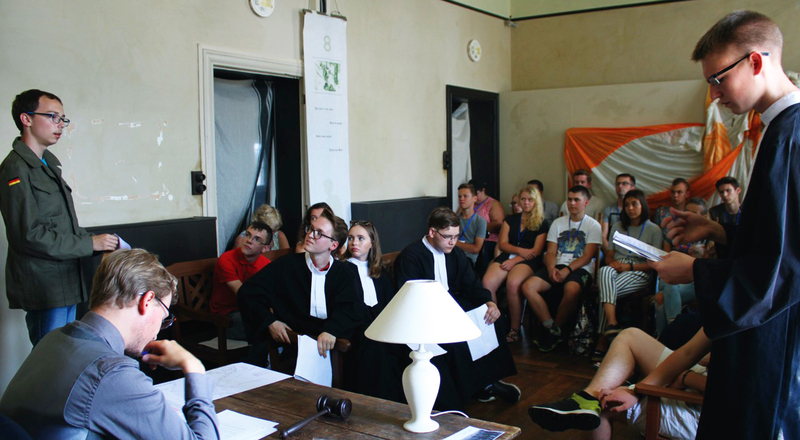 In July the project “Memory Work, Democratic Engagement and Civic Participation for the Future of Europe” was held in Houffalize where 70 Students were actively engaged in topics concerning the past, present and future of the EU. The students and their teachers flew in from Altea, Bad Kötzting, Bundoran, Chojna, Granville, Meerssen, Rovinj, Sherborne, Sigulda, Skofja Loka, Susice and of course Houffalize itself. The common theme of the meeting was considering the creation of the European Union, born from the war, as a means to preserve peace, which is by the way always good to remind to a generation that did not know war. Peace keeping is a supreme goal that must be kept in mind in times of Euroscepticism. The students were actively engaged by playing role plays such as reconstituting a court judging war crimes. The results were impressive for all present. The meeting ended by adopting a resolution to be presented to Donald Tusk, chairman of the European Council (download here). ← Rokiškis starts the project WINC and invites Douzelage partners to participate.